The official United States Department of Agriculture report for 2018 yields was released in late March after being delayed a month from the government shutdown. The report contains crop yields for each county in Ohio (and for all counties across the nation), which are estimated by the National Agricultural Statistics Service. Even though these are estimated numbers, government and industry use these values for historical records and farm payments. Putnam County farmers ranked 14th in the state last year by harvesting 75,000 acres of corn with a total production of 14.85 million bushels. While many farmers commented they reached 200 bushels per acre last fall, the official Putnam County average of 198 bushels per acre was well above the record-breaking state average of 187 bushels per acre. Of the surrounding counties, only Hardin (4th), Wood (6th) and Seneca (9th) were among the top ten producing counties in the state. Darke County was once again first with a production of 24.3 million bushels. Farmers consider it a great soybean crop when the county average breaks 50 bushels per acre. In 2018, that number was surpassed with a Putnam County average of 63.7 bushels per acre. Yields across the state ranged from a low of 33 bushels per acre (Vinton County) to a high of 67 bushels per acre (Mercer County) with an average of 58 for Ohio. This set a new state record average soybean yield for Ohio. Putnam County was among the top five soybean producing counties in Ohio in 2018. Farmers harvested nearly 140,000 acres of soybeans with a total production yield of 8.9 million bushels, giving local farmers a third ranking in the state for soybean bushels harvested. Other counties in the area also did well in state rankings: Wood (2nd), Hancock (4th), and Van Wert (5th). 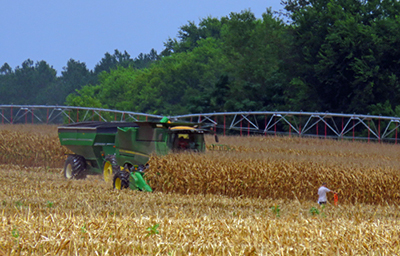 Darke County ranked first in the state with 9.313 million bushels. Wheat yields were good in the area with an average of 76.5 bushels per acre and slightly above the state average of 75 bushels per acre. Putnam County was once again the top producing county in Ohio for wheat production with 2.288 million bushels produced on nearly 30,000 acres. Wood and Paulding counties closely followed with second and third rankings, respectively. In 2018, wheat acres accounted for about 12% of the planted acres to grain crops in Putnam County. Soybean had the most acres at 57%, followed by corn at 31%. Most farmers were blessed with good crop yields this past year. They needed all the extra bushels to make up for low grain prices. Grain prices have been low to sluggish for the past five years and are projected to stay low this coming year. We hope for favorable weather and successful crops in the coming year as well. If you have questions or concerns about lawn and garden plants, crops, insects, or other issues related to agriculture and natural resources, please contact the Extension office by phone (419-523-6294), email scheckelhoff.11@osu.edu, or stop in for a visit at 1206 East 2nd St. in Ottawa.